The minimal footprint of ThreadX is as small as 2.5KB on CISC processors. Simply include the TX_API.H file in the application software and link the application objects with the ThreadX library. The resulting image is ready for execution. 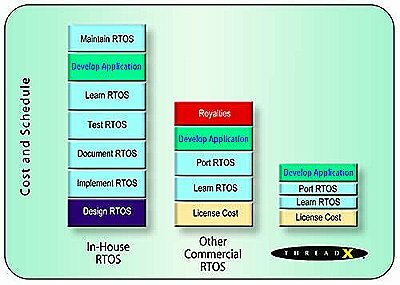 ThreadX is delivered with complete C and assembly source code so you can see exactly how ThreadX operates. Preemption-threshold allows the application to disable preemption over ranges of priorities instead of disabling preemption of the entire system.